Are you ready for the weekend? It’s summer and there’s a lot of exciting things going on! The Clifton Park-Halfmoon Library is holding one of their fun kid-friendly events: a series of short, literature-based films for ages three to six (and their siblings) to enjoy. Children must be accompanied by an adult. Schenectady’s signature summer event is happening this Friday. A variety of family-friendly performances will be taking place at various locations – indoor and outdoor – throughout downtown Schenectady. The focus will be on family entertainment with local bands, street performers, and food and craft vendors. This year’s main stage lineup includes the Gin Blossoms! Happening at the Clifton Common Stage is a musical based on the novel The Year the Yankees Lost the Pennant by Douglass Wallop. Joe Boyd sells his soul to the devil, Mr. Applegate, for “one good long ball hitter” for his team, the Washington Senators. His wish is granted, and the 22-year-old becomes a sports superstar. Do you like your chips salty, spicy, cheesy, or do you crave a different type of taste experience? No matter your preference, they’ve got it at The Chip Festival, happening at the Saratoga Springs City Center. Come and check out a National Chip Competition, sample chips from across the nation, and learn about potato chip history. 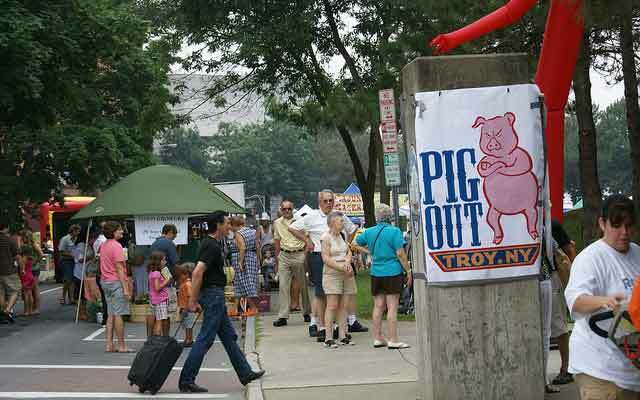 The epic Troy Pig Out is happening once again in downtown Troy. You won’t want to miss out on the best barbecue of the summer, to be enjoyed with a full day of music and family fun. Barbecue masters will be duking it out for the top prize in categories like best pulled pork, best barbecue chicken, best beef brisket, and more. Art on Lark is the second largest street festival in Upstate New York and has been voted the Capital Region’s Best Arts Event. Lark Street is shut down for local artisans to display their works – check out paintings, photographs, jewelry, sculptures, and live performances. All the regular businesses on Lark Street will also be open.